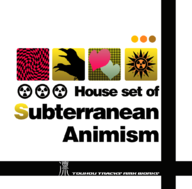 House set of "Subterranean Animism"
House set of "Subterranean Animism" is a doujin album by Kuroneko Lounge released on 2011-04-23. It is a house set and features instrumental arrangements of themes from Subterranean Animism. Alternatively it could be called the "chireiden set", as seen in the tracks. This page was last edited on 19 January 2017, at 21:13.